Searching for your perfect holiday cottage is easier with us. In fact it’s a doddle. You can be as exact or as flexible as you like. You can be ultra precise – exact time, location, and features – or you can be the kind of happy-go-lucky holidaymaker who’ll go anywhere at any time so long as you can take your dog and there’s somewhere to store your bike. Whatever you’re looking for in your next holiday-cottage getaway, you’ll find it here – and you’ll find it faster. You get more choice at HolidayCottageCompare. We designed our holiday-cottage database and search engine to reflect the way people pick their dream holidays. That’s why we’re so much more flexible. When you search here, you’re not constrained by where and when. If the only thing that counts for you is that you have a lake view and a double shower, those are the criteria you set. Your starting point is what you want, not what’s available on a particular week in a particular place. There’s no charge for all this freedom and flexibility. The price you pay for your holiday cottage is the price its owner or agent sets for it. It’s the best price available at the time you book, with no additional charges from us. So let’s start dreaming. Imagine what you want in your next holiday cottage, pop it into our search engine and see what comes up. You’ve put a lot of effort into getting your holiday-let portfolio just right – perhaps even a little bit special. The challenge is to find guests who are looking for the exact features you’ve put in. That’s our speciality. No other holiday-cottage rental site has as much flexibility or functionality as HolidayCottageCompare. No other site can funnel guests to your cottages with such precision. For example, if someone wants a barn conversion that sleeps four, is near a beach, has a coffee machine, costs under £600, is less than two hours’ drive away, and is free sometime in July, they’ll find it here. If that’s one of your cottages, you really should be advertising with us. Advertising with us is free. There are no set-up costs, no annual fees, no exclusivity clauses, and no tie-ins. So long as you’re using a compatible rental system, uploading your properties is effortless. Our software automatically identifies the features that make it unique. You have absolutely nothing to lose by advertising here. Best of all, you pay no commission until you receive a confirmed booking. And if you want to leave (we can’t imagine why you would), you just give us a month’s notice. HolidayCottageCompare.com is easily the UK’s most holidaymaker-friendly booking site. The search criteria are wide-ranging and unexpected: ‘broadband’, ‘downstairs bathroom’, ‘cats allowed’. It’s not about where and when, but the features you want in your ideal holiday cottage. 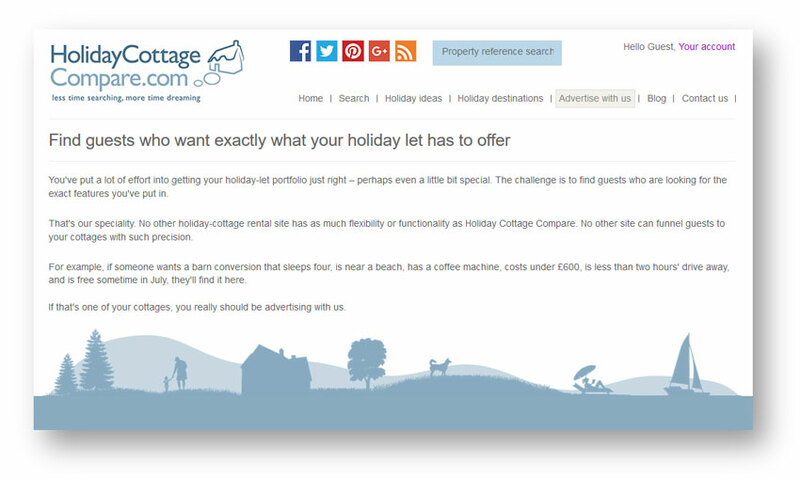 When we wrote the strapline and original copy, HolidayCottageCompare was a new start-up. Recently they came back to us for fresh copy to reflect the way the business had evolved.